… it’s a moment that won’t be bettered this Fringe. Pedro used to run and skateboard and play soccer and go to school … Not anymore. Pedro stays inside now. His best friend, Flora, thinks that’s boring and kind of freaky. But Pedro doesn’t care. He’s building a pillow fort (he would prefer you called it ‘The Death Star’) and it’s getting bigger and bigger every day. Every day it’s getting harder and harder for Flora to reach him. Pedro has the best Reasons to Stay Inside, but Flora knows what he’s missing and she will do whatever it takes to get her best friend to come outside. You can’t stay inside your fort forever, can you? A show about that irritating best friends, dancing pegacorns, pillow forts and that weird anxious feeling. For 8 to 108 year olds! Warner has personal experience of this kind of crippling anxiety, and this story is her way of throwing light on it. It’s to her very great credit that she never gets “grown-up” about it; “The Thing” never becomes agoraphobia or the other clinical conditions that Pedro may be suffering. The story remains a kids’ one, and salvation remains in their hands. Emma Annand is simply terrific as Flora. She’s toothy, radiant and irrepressible, an Energizer Bunny, a little engine that can. Oliver Coleman handles his difficult task with lovely skill, frustrating when we see him through Flora’s eyes, but courageous when we see things, and The Thing, through his. And when we hold up the little lights Annand gives us to show Pedro that it’s not really dark and scary outside, it’s a moment that won’t be bettered this Fringe. 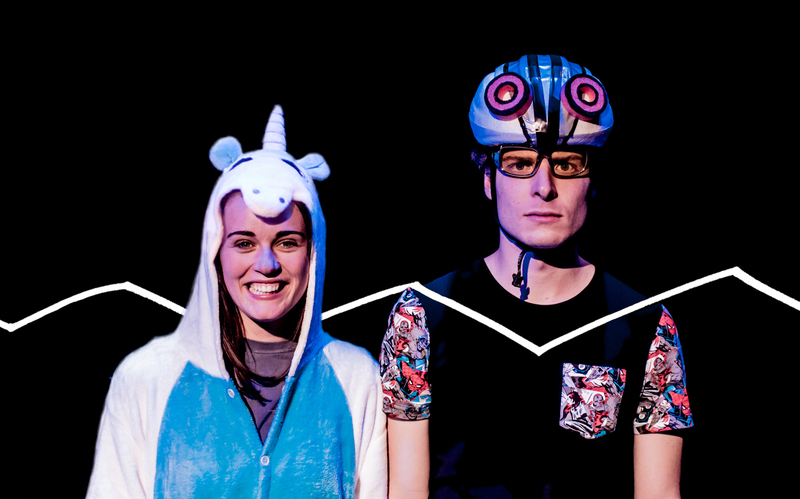 You don’t even need to have or borrow a kid to have a reason to see this creative, colourful, silly and thoughtful show, though if you do, you’ll be scoring some serious points with them. The kids in the audience loved every second of it, and, well, so did I.